Virgin and Child with St. Anne (Anna Selbdritt). Miniature on vellum mounted on a thin wooden board, illuminated in the workshop of Simon Bening. Flanders, Bruges, Ghent or Antwerp, c. 1510-1520. Tempera and gold on vellum. Board: 167 x 120 mm, exterior of border: 154 x 110 mm, central scene, H: edge, 105 mm; top of arch 115 mm, x W: 68 mm. A fine image of private devotion painted on vellum and mounted on wood, illuminated in the workshop of Simon Bening. Miniature. Tempera and gold on vellum, mounted on a thin wooden panel. Board: 167 x 120 mm, exterior of border: 154 x 110 mm, central scene, H: edge, 105 mm; top of arch 115 mm, x W: 68 mm. This leaf possibly once was part of a Book of Hours, functioning as the opening for the Office of the Immaculate Conception or for the Suffrages to the Virgin’s mother Anne. However, it may also have found use as a devotional panel. This would be similar to another miniature, Virgin and Child (which was previously available at Jörn Günther Rare Books), as both are mounted on a thin oak board and were skilfully extended by a second painter who added further borders at the top and right (see Cat. 6, no. 60, Hamburg 2002). The miniature at hand shows the Virgin’s mother Saint Anne sitting on a ‘grass’ bench (or ‘zodenbank’), with Mary and Jesus seated before her. The three saintly figures are represented before a high blue canopy with golden patterns and pious inscriptions referring to the Virgin and her mother. Anne, depicted as a mature woman with blue headscarf and white veil, is clothed in a golden dress and a fawn cape. She reads from a book while her youthful daughter, in a light blue robe with open blond hair, sits at her feet, embracing the little boy on her lap. The Christ Child holds a small golden ball with a red contour in his hands that could either be an orb or a fruit. In the background, elaborate architecture is visible that could well hint to an actual Flemish city. Two peacocks and a veiled figure with a stick and a dog walk the streets. 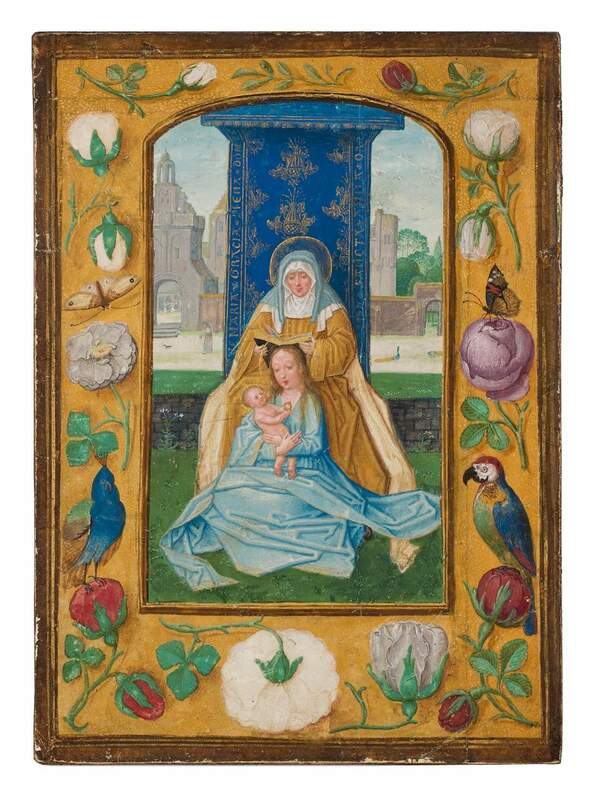 It is known that miniatures by Simon Bening (c. 1481-1561) also served for private devotion and were re-adjusted to become small panel paintings. For this purpose, the four margins needed to be equally balanced with additions to the top and right. Probably these were also executed in the 16th century by an excellent illuminator. The miniature is therefore surrounded by a charming four-sided border in the typical Ghent-Bruges fashion with a variety of rosebuds and rose flowers, accompanied by a peacock, a parrot, and butterflies on liquid gold ground. See also our miniature of David from the Bening workshop.